There’s an old joke that the definition of quandary is when your mother-in-law drives off a cliff in your new car. But since I’m not married, I can’t use that joke. Besides, I’m a policy wonk, so the type of quandary that catches my attention is when the Obama Administration delays big parts of Obamacare (hooray! ), but does so by cavalierly deciding to disregard the law (boo!). Unfortunately, this isn’t a joke. Why is this important? Here’s some of George Will’s analysis of how Obama is subverting the law. President Obama’s increasingly grandiose claims for presidential power are inversely proportional to his shriveling presidency. …at last week’s news conference he offered inconvenience as a justification for illegality. …Serving as props in the scripted charade of White House news conferences, journalists did not ask the pertinent question: “Where does the Constitution confer upon presidents the ‘executive authority’ to ignore the separation of powers by revising laws?” The question could have elicited an Obama rarity: brevity. Because there is no such authority. Will then cites the infamous example of Nixon arguing that, “when the president does it, that means it is not illegal” and compares that to Obama’s lawlessness. And he also dings Obama for creating – out of thin air – a special handout for members of Congress and their staffs. Charles Krauthammer is equally uncomfortable with the erosion of the rule of law. His column includes a good summary of how Obamacare is being arbitrarily enforced. Or, to be more accurate, how it’s not being enforced. 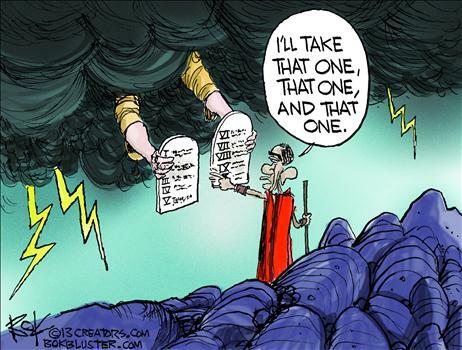 …the administration…unilaterally waived Obamacare’s cap on a patient’s annual out-of-pocket expenses — a one-year exemption for selected health insurers that is nowhere permitted in the law. It was simply decreed by an obscure Labor Department regulation. 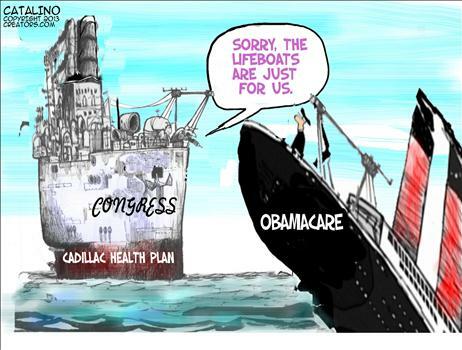 Which followed a presidentially directed 70-plus percent subsidy for the insurance premiums paid by congressmen and their personal staffs — under a law that denies subsidies for anyone that well-off. Which came just a month after the administration’s equally lawless suspension of one of the cornerstones of Obamacare: the employer mandate. Which followed hundreds of Obamacare waivers granted by Health and Human Services Secretary Kathleen Sebelius to selected businesses, unions and other well-lobbied, very special interests. He then accurately explains that we are entering an unpleasant world where the law is not what’s written, but whatever politicians arbitrarily decide on any given day. The point is whether a president, charged with faithfully executing the laws that Congress enacts, may create, ignore, suspend and/or amend the law at will. …Such gross executive usurpation disdains the Constitution. It mocks the separation of powers. And most consequentially, it introduces a fatal instability into law itself. If the law is not what is plainly written, but is whatever the president and his agents decide, what’s left of the law? The problem is not just uncertain enforcement but the undermining of the very creation of new law. What’s the point of the whole legislative process — of crafting various provisions through give-and-take negotiation — if you cannot rely on the fixity of the final product, on the assurance that the provisions bargained for by both sides will be carried out? He closes by noting that Obama seems quite proud of his illegal behavior and he warns that America is becoming a banana republic. …this president is not only untroubled by what he’s doing, but open and rather proud. As he tells cheering crowds on his never-ending campaign-style tours: I am going to do X — and I’m not going to wait for Congress. That’s caudillo talk. That’s banana republic stuff. In this country, the president is required to win the consent of Congress first. At stake is not some constitutional curlicue. At stake is whether the laws are the law. And whether presidents get to write their own. 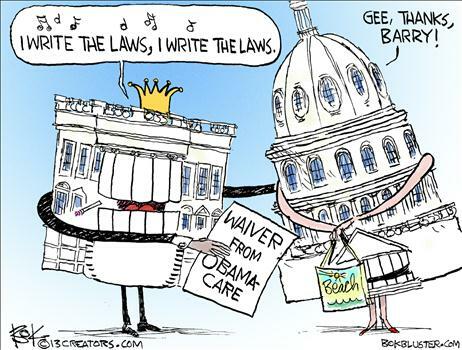 This is a very troubling issue, so let’s enjoy some gallows humor with some cartoons about Obama’s lawlessness. Those of you who read Orwell’s Animal Farm will agree that this Eric Allie cartoon is especially insightful. 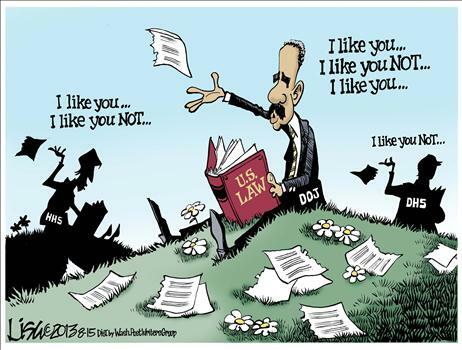 Here’s a Chip Bok cartoon about The One deciding which laws to enforce. Sort of reminds me of this joke about his approach to the Constitution. Not surprisingly, disregard of the law even extends to the President’s top legal appointee. 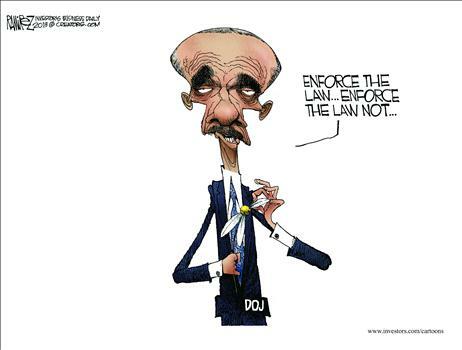 Michael Ramirez shows how the Attorney General decides which laws to enforce. 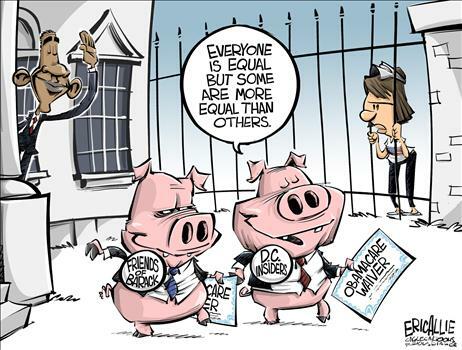 And Lisa Benson has the same theme in a cartoon that includes other Cabinet officials. 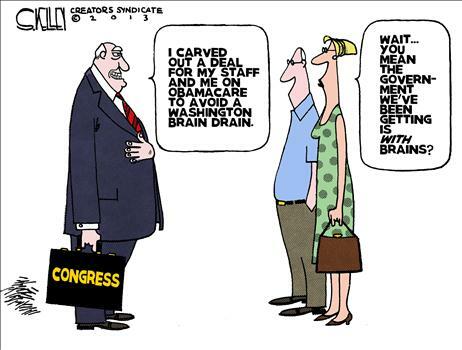 Here’s another Chip Bok cartoon, this one focusing on the illegal decision to grant subsidies to politicians and their staff. And since we’re making fun of self dealing for the political class, let’s look at a couple of cartoons that focus on Obama’s arbitrary gift for Capitol Hill. Last but not least, here’s Ken Catalino making fun of Washington’s gilded class putting themselves first. Let’s close with a final serious point. Here’s some of what I wrote a couple of years ago to describe the banana republic of Argentina. …the problem is crony capitalism. Argentina’s economy, for all intents and purposes, is one giant Fannie Mae/Freddie Mac/Obamacare/General Motors/Goldman Sachs Obamaesque dystopia. Government has enormous influence over every major economic decision. It’s like being in the middle of Atlas Shrugged, as political connections are the way to get rich. This type of approach is far worse than the Scandinavian welfare state. Yes, the official size of government is bigger in places such as Sweden, but the negative role of government intervention is far more pervasive in Argentina. But I actually understated the problem. Much of what I wrote was a critique of interventionism and the corruption that is facilitated by big government. That’s part of what defines a banana republic (with Obamacare being a perfect example), but arbitrary law is another characteristic. And that’s what’s so worrisome about what the Obama Administration is doing. Thank you for your current article, it is rather useful, is sure to try to experiment what you possess indicated… there is certainly only one issue I want to discuss in more detail, We wrote a message to your handle about it. Government will always enter the marketplace to purchase goods and services. To what extent the procurement process is clear, transparent and above-board, and to what extent as far as volume of business is concerned that all of it is the bare minimum necessary (with perhaps a slight cushion against unforeseen situations)– these are the questions to be asked. I believe it was Madison, though I can’t cite you chapter and verse, who observed that government offices are filled with those who have paid good money to see the office holders elected, and expect to see a return on their investment by having business thrown their way when, as and if convenient for the government to do so; and that raiding the public purse to reward private interests was the quickest way to subvert the government unless the people held them and the interests accountable. But once Congress/any legislative body realized they had the power to be able to buy off the people as well, so that they would not hold the government to account, that we would be doomed once the legislature did so. For some time I have wondered if the traditional capitalism-communism axis is getting unusable. It seems more servicable to measure the distance between the economic and political powers in a country. In a communist coutry, the government owned all business, so the distance was 0. In corrupt third world nations, el presidente and his cronys control all the major player in the economy, so the distance is close to 0. In coutries that are functional, or in the case of thrid-world nations, that are actually improving, there seems to be a larger distance between the economic and political actors. This, in fact, seems to be a signal of success across a number of otherwise different political settings. Given all this evidence that Obama has failed to uphold the US Constitution and his oath of office, why isn’t that good grounds for impeachment? The Democrats are too corrupt to agree to it and the Republicans are too scared and powerless to do so and the country is the poorer for it. Mr. Richards is spot on… we are indeed in deep trouble… take the situation in Egypt… a coup… military dictatorship… American law and 1.5 billion is us aid at stake… now this is not humanitarian aid… not wheat to make bread… it’s military hardware… mostly tanks and aircraft which Egypt has no need for… in fact the “aid” will go into Egyptian warehouses… to be used for undisclosed purposes by a future Egyptian government… the democrat and republican politicians here want to break the law… to support their buddies in the defense industry… crony capitalism… and the military industrial complex at it’s worst… the rule of law violated by the very people sworn to uphold it… the excuse for breaking the law? protecting defense industry jobs… and [of course] assuring continued defense industry campaign contributions to corrupt slime oozing democrat and republican politicians… trouble? we got plenty……………. Dan may think this isn’t a joke, but, from another perspective, it is: a big honking joke on us. Obama wants to be a dictator. Since the SCOTUS has re-defined this as a tax, then isn’t the president exempting them from paying their taxes? Great point and it needs to be hammered again and again and again. Even on Fox News, in Bret Baier’s Special Report All-Star Panel yesterday (8/15) when the panelists were talking about aid to Egypt, they treated the current law, which is supposed to stop foreign aid after a coup, as completely beside the point. When the administration adopts the mentality that the law is beside the point, we are in trouble. When our ordinaritly fair & balanced journalists, not just the official Obama Cheer Squad media, adopt the same mentaility, we are in deep trouble.